When roof shingles begin failing simple repairs may not be enough. If there are multiple points of failure and leaks are occurring a total roof replacement may be needed. This can be caused by failing shingles due to the exposure of time, or from a major hail storm. A lot of times however if your roof is several years old a smaller hail storm can cause significant damage. In either case it requires a trained professional to determine the extent of damage and whether a repair or replacement is needed. At K & M Roofing and Construction we use GAF shingles that provide both, durability, and an aesthetic beauty to your roof. With GAF you will have confidence that your shingles are designed to last. Not only is replacing your roof a big financial investment, but it is also an investment in security as well. We carry seven different color options to either match your existing shingle color, or give your home a fresh makeover in style. How Do You Know if Your Roof Needs Replacing? Age: Roofs are designed to last 20 - 25 years on average. If your roof is getting close to this time frame it is recommended that you really have it examined. Damage Inside the House: If you are seeing water spots on the ceilings, cracked or warped wood fascia on the exterior or water damage in the attic or walls, it could be time to replace your roof. Granules in Gutters: If you find shingle granules inside your gutters or along the drip line of the house a new roof may be needed. 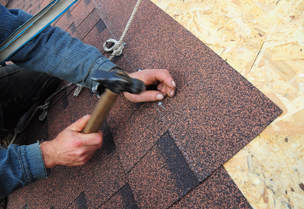 Damage to Shingles: Shingles are an essential part of your roofing system. When shingles become curled at the edges, cracked or begin to buckle, it may be time to have your roof replaced. Missing shingles are also a good sign that replacement is necessary. There are many more signs that your roof is in need of being replaced. Contact K & M Roofing and Construction today to determine your roofing needs. Don't Hesitate - Call Us Today!! !